I hear the discourse about Common Core and students opting out from taking the tests. Not sure what my stance is on Common Core tests – I do not have kids, so I am not sure of the emotional toll underperforming on a test has on a child’s psyche. And, from my understanding, this is a big reason students are opting out from taking the tests. Maybe tests results will improve as teachers become familiar with Common Core; according to a recent survey– thirty-nine percent of teachers feel “very prepared” to teach the standards (up 20 percentage points from 2002). Undoubtedly, there is a lot of pressure on teachers who may lose their job due to poor test results. Similarly, many schools must meet expectations or be closed. I agree. I think focusing on the testing aspect is narrow and misses the tremendous overall value of Common Core standards. Some of the benefits include: 1) having transparent and easily accessible standards; 2) building ‘core’ foundational skills – critical thinking, problem solving, and analytic skills; and 3) representing a nation-wide audience of students. The standards are online and accessible to anyone: students and their parents, teachers, educators, community planners, and third-party organizations. Companies creating education games match learning outcomes from playing their game with Common Core standards. This is something Sim City has already accomplished, for example. Imagine the improvements in learning through experiences, by playing games, participating in virtual reality, or working on projects. For an underperforming student, student and parents find supplemental resources outside of the classroom and teachers craft personalized, more intensive learning plans. Average students choose how much time they want to dedicate towards learning. Those who want to spend more time can compete with students who have more ability. High performing students demonstrate required competencies and move on (if they can). Moving on after reaching a desired competency is an advantage of Competency Based Learning (“CBL”), something that is gaining momentum in higher education. Do not base learning on how much time is spent in a classroom, but rather on reaching a desired skill competency. Future versions of Common Core might have CBL, where learning is defined by skill competencies rather than grade levels (as currently implemented). The biggest hurdle is finding a way to accurately measure competencies in an almost instantaneous way; also make the evaluations subtle, where students do not have to sit-down to take a two hour test. Perhaps CBL in K-12 requires a blended learning model (combine classroom with online learning) as the framework and Skills-Based Approach as the platform. There is nothing wrong in having a ‘common core’ as a national system. Publishers of books and articles, designers of online course and curriculums, creators of games and devices distribute their resources to a larger audience. Per the same survey mentioned above, only 18% of teachers strongly agree that their resources were aligned with the standards (up from 9% in 2002). Without a doubt, the number of aligned resources increases significantly as large technology companies and education institutions tailor their products to Common Core standards. (Of course, this is another driver of improved test results.) Students will have choices on how they learn because of a plethora of types of resources (books, games, lectures, online classes, etc.). Finally, let’s remove associating education to zip codes and demographics by providing equal access to these resources for all students. 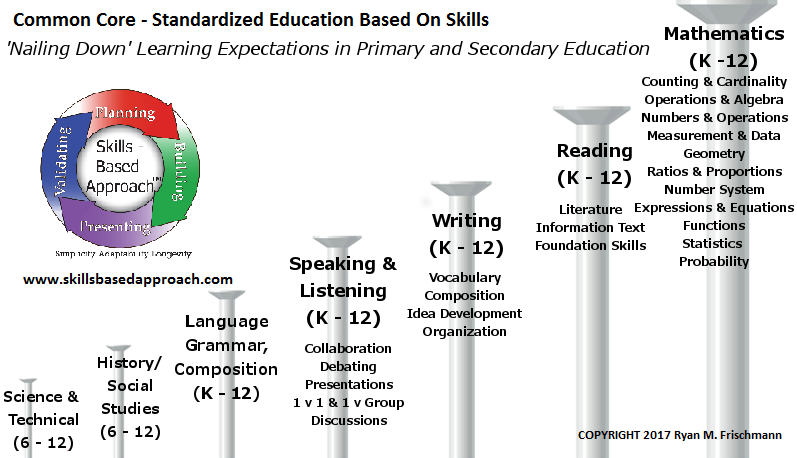 Skills-Based Approach is an ideal platform to work with Common Core. Skills-Based Approach is centered on the development of an evolving skill set throughout education, higher education, and a career. One link between education and higher education is both focus on developing critical thinking, problem solving, and analytic skills. Skills-Based Approach has an expanded interpretation in learning these skills to include their underlying methods and applications. In addition, Skills-Based Approach effectively handles all the technical skills a student acquires along their learning path.